In a medium bowl, combine 1/4 cup cracker crumbs, 1/2 cup Classico® Four Cheese Alfredo Pasta Sauce, salmon, celery, onion and egg. Chill for 15 minutes. In a shallow pan, place remaining cracker crumbs. Remove salmon mixture from refrigerator and using a soup spoon, form into small spheres, about 24. Coat with cracker crumbs and place onto a baking sheet. Bake for 15 minutes or until outside is a golden brown. Meanwhile, arrange cucumber slices on a serving dish. In a small pot, heat remaining pasta sauce over medium heat for 3-5 min, stirring occasionally. 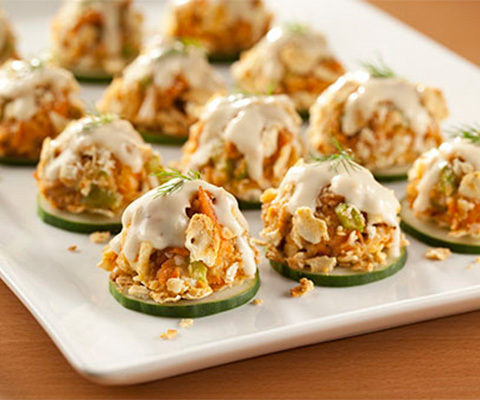 Place one croquette on each cucumber slice and top with a dollop of the remaining sauce.